September 13, 2018--I'm trying a new threading technique I recently heard or read about and find it works very well. Wish I could remember where I learned this--would love to give credit where credit is due. First, I read when using multiple strands of floss, (cotton, silk, etc. ), it's easier to lay the stitches on your canvas if you reverse some of the threads in the needle. For example, if you have 4 strands in your needle, reverse 2 of the strands. I believe this works because the "nap" of the floss isn't all going in the same direction. However, you won't see any difference in appearance of the threads once stitched and you should have less "knotting" and twisting. Second, if you cut a piece of thread twice the length you normally use, then pass the end of that length through the needle and match up the ends--you will have a naturally occurring reversal of threads. 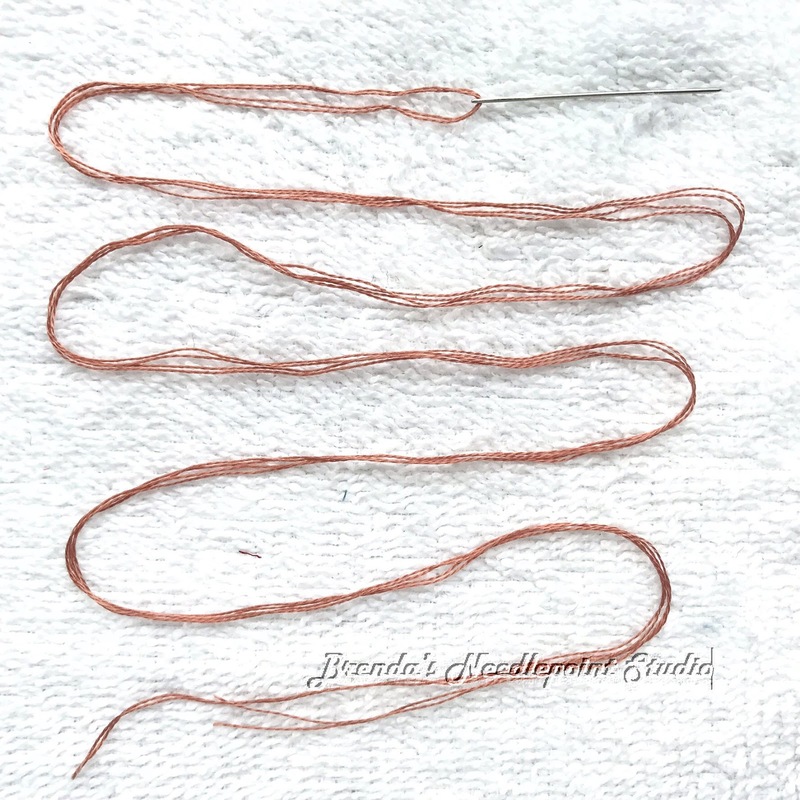 Of course, be sure to separate out each strand from your skein before placing multiple strands in the needle. 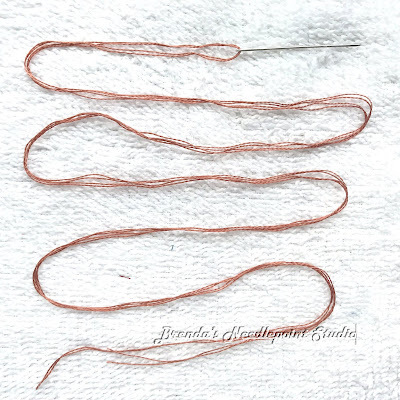 Third, using this method of threading your needle leaves you with NO tail at the needle's eye, so you will need less thread when ending. Fourth, your thread won't slip out of the needle's eye when pulled too hard or if the needle is left to dangle. Fifth, the thread nearest the needle will no longer be damaged as you move the ends away from or nearer the eye (you won't have to do this). Have I convinced you to try this yet? LOL. Here's a photo of 2 strands threaded through a needle's eye, then folded over to make 4 strands. PS: If you make an error and must "reverse" your stitching and the needle gets caught in stitches above or below the row you're working on, just cut your thread closest to the needle's eye, undo your stitches that were done incorrectly, then thread up again as you had done in the past. I do this when I'm beading and I need a doubled thread. The eye of the needle is so small you can't thread two strands. If you're careful you can reverse the stitching by pulling the needle back into the fabric. I too use this method when using a double thread for goldwork. But unstitching is quite difficult! Thanks for the tip about laying the multiple threads in a different direction to help them sit nicely. I had great troubles with this in my canvaswork piece! Thanks for the tip about reversing a couple of the threads to lessen tangles. Some threads seem to be more prone to tangles than others. Anything that will help with that is definitely worth a try.